What few people realize is that this building has an even older place in Orthodox history. In March 1865, it was the site of the first documented Orthodox liturgy in New York, celebrated by the infamous Fr. Agapius Honcharenko. Several years ago, I wrote about that original church service and Trinity Chapel / St. Sava Cathedral. 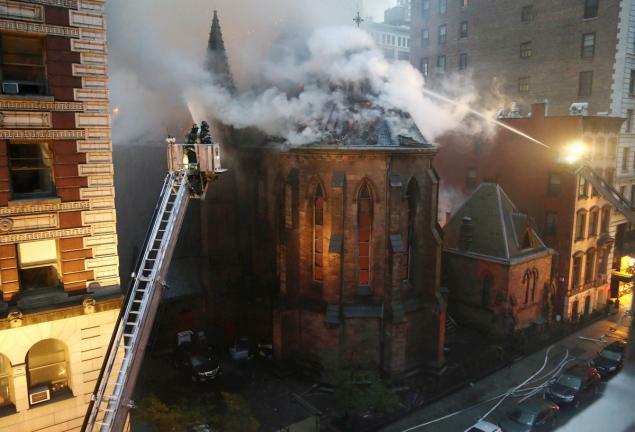 I don’t want to take attention away from the immediate crisis facing the Serbian Orthodox community in New York, but this being a history website, I felt it appropriate to reprint, with some minor revisions, the substance of my articles on the church. On March 2, 1865, New York City witnessed its first-ever Orthodox liturgy. The service was held in Trinity Chapel, which belonged to the Episcopal Church. The priest, Fr Agapius Honcharenko, was originally from what is now Ukraine and what was then a part of the Russian Empire. But he came, apparently, from the Church of Greece: he had been sent, or perhaps volunteered, to serve as a priest for the handful of scattered Orthodox Christians in America. This 2nd. day of Lent was a memorable one, because the Liturgy of the Eastern Church was sung in Trinity Chapel, at 11 A.M. This never occurred before so far as I have heard, in any Anglican Church. Bishop Potter was to have been there, but backed out, and went down to S. Paul’s instead, to the noon day communion. A full account of this delightful service, will be found at the end of this diary; I cut it out from the Evening Post. The Times actually reprinted several sections of the liturgy itself. The Protestants present were especially struck by the absence of the filioque from the Creed. The music, sung by a small group of Episcopalians, was provided by a certain Dr Young. This man was a member of the Russo-Greek Committee of the Episcopal Church – the group charged with fostering relations with the Orthodox Churches. Dr Young had brought texts and music back from a visit to Russia, and he put the Slavic words into English phonetics for the occasion. News of the event quickly traveled around the world. It was reported in Orthodox publications in Russia and France. The French Orthodox journal Union Chretienne soon broke the news that Honcharenko had been involved with the exiled Russian radical Alexander Herzen, and had written several articles criticizing the Russian Church. This revelation led the Orthodox of New York to cut off contact with Honcharenko, who went on to have many more strange adventures over the next several decades. Trinity Chapel originally belonged to Trinity Church. It was built in the 1850s, and despite being called a “chapel,” it had a considerable congregation. By the 1940s, though, demographics had changed, and church leaders decided to sell the building. New York City’s first full-blown Serbian parish had begun in the late 1930s, and as soon as they heard that the chapel was on the market, they were interested. With help from St Nicholai Velimirovich, Serbs from across the country, and the Episcopalians themselves, the modest Serbian parish was able to purchase Trinity Chapel in 1942.